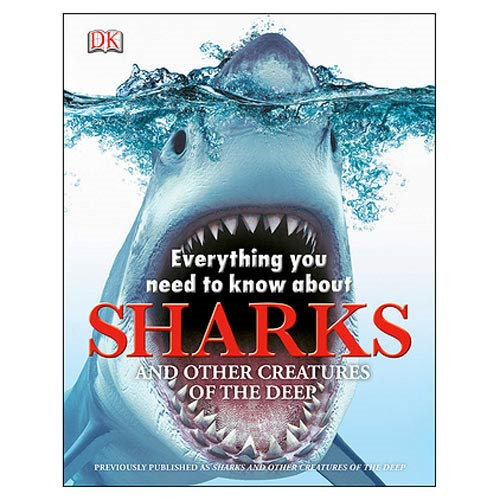 Dive deep in pursuit of fascinating facts with this illustrated look at some of the most dangerous examples of underwater life in Sharks Everything You Need to Know Hardcover Book. With over 200 photographs and illustrations, plus quizzes, maps and an index and glossary, the surprising secrets of sharks and how and where they live plus amazing facts about other creatures of the deep such as whales, octopus, jellyfish and eels are revealed! The Sharks Everything You Need to Know Hardcover Book spans 80 pages and is recommended for readers ages 7 and up. Now you, too, can live every week as if it were Shark Week! Measures approximately 11-inches tall x 9-inches wide.